Gallery of emotions for alterations of cosmetic make-up. If emotional expressions of female face have inconstant variations then respective alterations of cosmetic make-up are necessary, that discrepancies of emotions and physiognomic designs will be not appreciable in facial features. Quiet eyebrows and open eyes seem cheerful as the mouth expresses joyful emotions. The joyful mouth and quiet eyebrows seem outspoken as eyes express open emotions. The joyful mouth and open eyes can seem calm as eyebrows express quiet emotions. The open eyesight is cheerful as feelings are pleasant, but in quiet ideas there is no pleasure. Desires of the person have satisfaction or gratification as sensations are happy, but mind keeps calm. 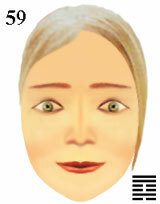 emotional alterations of cosmetic make-up in features of a face.